Producer and CSUN alumnus Michael Grillo, who served as executive producer on movies such as Marvel’s “Avengers: Infinity War,” “Ant-Man,” “Captain America: The Winter Soldier” and “The Amazing Spider-Man,” launches this semester’s Distinguished Speaker Series in California State University, Northridge’s David Nazarian College of Business and Economics on Wednesday, Sept.26. He will talk about his time at the university and what helped launch his career in the entertainment industry. In addition, Grillo will share his insight on navigating the financial and creative aspects of filmmaking addressing the struggles and rewards of his work. “For our distinguished speaker series, we try to bring in people who have had success in their careers and that would be relevant to our students,” said Jordan Helo, development associate in charge of organizing the event. The Distinguished Lecture Series was created through a gift from the Leon Lowenstein Foundation and marks the fourth semester the Nazarian College will host the event. 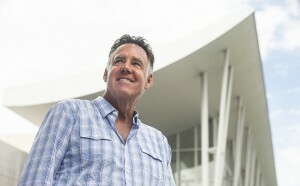 Past speakers have included Henry Cisneros, former Secretary of Housing and Urban Development in the Clinton administration; Jane Wurwand, founder of Dermalogica, the largest professional skincare brand in the world; and Steve Rabuchin, vice president for Amazon Alexa Voice Services and Alexa Skills. Both Steve Rabuchin and Michael Grillo are alumni of the university. “If we are able to get an alum, even better because then our students are able to connect with them on a different level,” explained Helo. Grillo ‘71, graduated from what was then San Fernando Valley State College with a degree in business administration. CSUN’s University Student Union is located on the east side of the campus off Zelzah Avenue.